An experiment was conducted during two successive seasons, 2008/2009 and 2009/2010, on the Zaghloul date palm cultivar grown in calcareous loamy sand and irrigated with drainage water. The purpose of the experiment was to investigate the effects of 1,000 g total N per palm applied as either ammonium sulphate, ammonium nitrate or urea and two levels of potassium (K2O) and elemental sulphur (S) on the nutritional status, productivity and fruit quality of the cultivar. The results of the study showed that the ammonium sulphate form (N1) increased the fruit yield, weight, length and colour compared to the ammonium nitrate (N2) or the urea form (N3). Fruit TSS, sugars, anthocyanin and dry matter content increased, whereas fruit acidity and tannins decreased under N1 fertilisation. Furthermore, the potassium and sulphur fertilisation enhanced the physico-chemical characteristics of the fruit. The N1 application increased the leaf N, K, Ca, Fe and Zn contents, as did the potassium and sulphur application. The N1 application increased the fruit N, P, K, Fe and Zn contents, whereas the fruit Cd, Pb and NO3 were highest with N2. The potassium and sulphur applications increased the fruit N, Fe, Mn, Cd, Pb and NO3 contents. Keywords: Fertilisation; Calcareous Soil; Drainage Water; Date Palm. Date palm (Phoenix dactylifera) is the most common fruit tree grown in semiarid and arid- regions of the Middle East and North Africa. In Egypt, many farmers rely on date palm cultivation. According to FAO (2010), Egypt is considered the leading country among the top ten date producers (1,130,000 tonnes). Date palm fruits are one of the most important export fruit crops in Egypt, where they are harvested and marketed at three stages of their development. The three stages are khalal (bisr), rutab and tamar. Dates in the khalal stage appear first in the harvesting season and therefore find a ready market. The best date varieties suitable for marketing at the khalal stage are Zaghloul dates, which are the most economically important soft cultivars grown in Egypt. Generally, they are grown and are highly productive under stringent environmental conditions that may be not suitable for many other species of fruit trees. The palms investigated in the present study were grown in loamy calcareous soil and irrigated with drainage water. These conditions strongly influence the amount of nutrient uptake. Therefore, the adaptation of a proper fertilisation program, including adequate rates, appropriate sources and efficient application methods and timing are important strategies for obtaining better yield and fruit quality (Fageria and Baligar, 2005). Nitrogen is known to be one of the most important elements for plant nutrition and development because it plays an important role as a constituent of all proteins, nucleic acids and enzymes (Nijjar, 1985). The forms and levels of nitrogen, the cultivars considered and the physico-chemical properties of the soil are all related to the use of nitrogen by plants (Li et al., 2007). The form of nitrogen applied can play a significant role in plant growth and productivity (Sady et al., 2008). Ammonium (NH4+), nitrate (NO3-) and urea are the forms of nitrogen generally applied. Different nitrogen sources may be preferred for use with different plant species (Marschner, 1995). 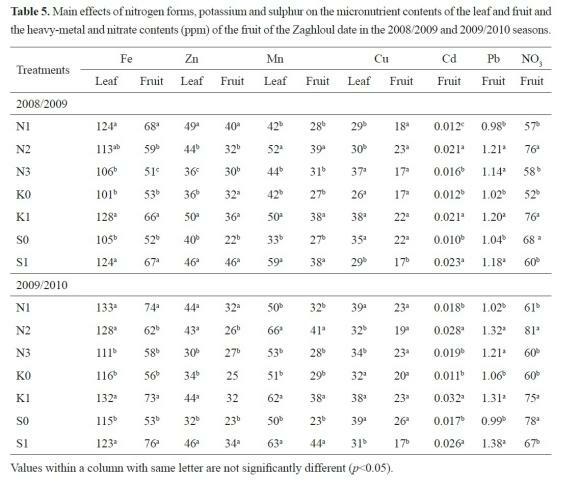 The responses of a large number of fruit trees to the application of different nitrogen forms have been reported previously (Saleh et al., 2000). Potassium is also an important nutrient for date palm growth and productivity (Al-Kharusi et al., 2009). Potassium is necessary for basic physiological functions, such as the formation of sugars and starch, the synthesis of proteins, cell division and growth, fruit formation and could improve fruit size, flavour and colour (Abbas and Fares, 2008). Potassium has been shown to promote plant disease reduction, and potassium stress can increase the degree of crop damage by bacterial and fungal diseases (Holzmueller et al., 2007). Furthermore, the last few years have seen increasing concern regarding the use of sulphur applications to reduce alkalinity in calcareous soil (Abbey et al., 2002), and sulphur has become one of the most strongly limiting nutrients in agricultural production (Eriksen et al., 2004). In the present market economy, product quality has become increasingly important. Therefore, the objectives of the present study were to investigate the effects of different forms of nitrogen and potassium (K2O) and sulphur fertilisation (S) rates on the yield, leaf and fruit mineral content, fruit marketing characteristics and food quality of Zaghloul dates grown in calcareous soil irrigated with drainage water. The present study was conducted during the 2008/2009 and 2009/2010 seasons on 22 year-old Zaghloul date palm trees grown in calcareous loamy, sandy soil inat a private orchard located in the Mariut region, near Alexandria, Egypt. The palms were planted 10 metres apart and irrigated with drainage water. 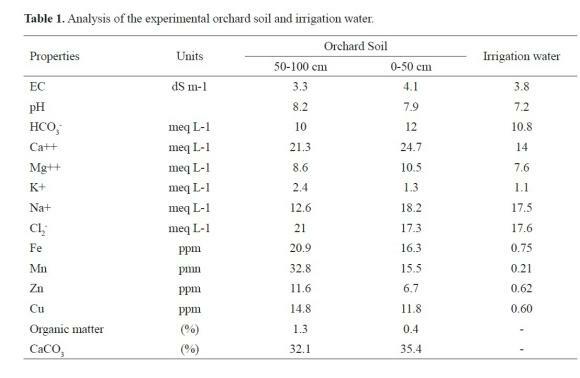 Analyses of the soil and irrigation water are presented in Table 1. In December 2008 and December 2009, cattle manure (~1.5% N) and calcium superphosphate (15.5% P2O5) were applied at the rates of 25-30 and 1.5 kg/tree, respectively. All the routine agro-technical operations were performed according to the traditional schedule for date palm culture. The leaf/bunch ratio was adjusted in both years by the end of the blooming season to a value of 10:1 for all experimental palms. One kilogram of total nitrogen per palm was applied as ammonium sulphate (21.5% N) (N1), ammonium nitrate (33.5% N) (N2) or urea (46 % N) (N3). Two potassium (K2O) levels (K0 = 0.0 and K1 = 750 g K2O/palm) as potassium sulphate (48% K2O) and two elemental sulphur levels (S0 = 0.0 and S1 = 500 g/ palm). These nutrients were applied alone or in combinations to study their influence on leaf mineral content, palm yield and fruit quality. In both experimental years, the nitrogen fertiliser was divided into four equal doses and added in March, April, May and July. The potassium fertiliser was divided into three equal doses and added in March, May and August. The elemental sulphur was applied as a single dose in December with the manure fertiliser. Twelve fertilisation treatments representing all possible combinations of the three forms of nitrogen fertiliser, two levels of K2O and two levels of S fertiliser were used (3x2x2=12 treatments). Each treatment was broadcast on the soil surface (~ 1.5 metre from the palm trunk). The palms were irrigated immediately after addition of the fertiliser. The experiment was conducted as a split-split plot study in a randomised complete design with three replicates (1 replicate = one palm) for each treatment (3 repli- cates x 3 N forms x 2 K2O levels x 2 S levels). The study used 36 palms with uniform characteristics. The soil moisture content was kept at an appropriate field capacity for sandy soil (50-75%). In both study years, the palms were harvested in mid-October when fruits reached the khalal stage (fully mature, crunchy and red in colour). The average fruit yield/tree and bunch weight were recorded in kilograms. Additionally, fruit samples were randomly taken from four different bunches to determine the values of the physico-chemical characteristics chosen to represent fruit quality. A fruit sample of 30 mature dates was collected for each replicate. The fruit weight (g), length (cm), width (cm) and shape (length/width) were determined. The fruit colour was measured with the following colour intensity scale: (1) = 100% green, (2) = 25% red, (3) = 50% red, (4) = 75% red and (5) = 100% red. A sample of 40 mature dates for each replicate was used to determine the chemical characteristics of the fruit. The fruits were peeled at evenly spaced locations in their equatorial region and were cut into small pieces with a clean knife. The anthocyanin content in 1 g fruit peel tissue was determined according to Fuleki and Francis (1968). Five grams were taken from the fresh whole fruit (peel + pulp) to extract the reducing and non-reducing sugars with water at 85Â°C and the 3,5- dinitrosalicylic acid to extract the sugars (Barbin, 2006). The percentage of non-reducing sugars was determined by hydrolysis with hydrochloric acid to produce reducing sugars. The percentage of reducing sugars and the amount of total sugars was determined according to AOAC (1995). The non-reducing sugar content was determined by calculating the difference between the total sugar content and the reducing sugar content. Another 5 g sample was taken to determine the soluble tannin content (g/100 g fresh weight) according to Abou Sayed et al. (1997). The percentage of total soluble solids (TSS) in the fruit juice was determined using a hand refractometer. The acidity (as malic acid) was determined according to AOAC (1995). Fruit dry matter (%) = [average dry weight/average fresh weight] x 100. In mid-October of both growing seasons, three consecutive leaves (located just below the fruiting zone and approximately two years old) were chosen at random from each replicate (Reuther, 1948). The leaf samples were washed with tap water, rinsed twice in distilled water and air dried in an oven at 70Â°C. The dried leaves and fruits were ground and digested with H2O2 and H2SO4 according to Evanhuis and De Waard (1980). Suitable aliquots were taken for the determination of the mineral content. Nitrogen was determined by the Kjeldahl method (AOAC, 1995). Phosphorus was determined by the ascorbic acid method according to Murphy and Riley (1962). Potassium and sodium were determined with a flame photometer. The Ca, Mg, Fe, Zn, Mn, Cu, Pb and Cd contents were measured using a Model 305 atomic absorption spectrophotometer (Perkin-Elmer Corp., Norwalk, CT 06586). The concentrations of N, P, K, Ca, Na and Mg were expressed as percentages. The concentrations of Fe, Mn, Zn, Cu, Pb and Cd were expressed as parts per million (ppm) on a dry weight basis. The nitrate content of the fruit was determined spectrophotometrically at 540 nm, then calculated as mg/kg dry weight as described by Singh (1988). The obtained results were evaluated using a split-split plot design with a three-way analysis of variance (ANOVA). In the randomised complete design, the N forms were randomised in the main plot, the potassium levels were assigned to the subplots and the sulphur rate was assigned to the subplots. The main effects of the nitrogen form, potassium and sulphur level were compared using a least significant difference (L.S.D.) test at the 0.05 significance level. Calculations were performed with Statisticaâ¢ for Windows software version 6.1 (Statsoft Inc., 2001, Tulsa, Oklahoma, USA). For all the potassium and sulphur applications, the results showed that the yield components were higher with the applications of N1 and N2 than with N3. Furthermore, N1 resulted in a higher yield than N2. In addition, potassium (regardless of the N form and the S application) and sulphur (regardless of the N form and the K2O application) fertilisation significantly increased the fruit yield in both seasons (Table 2). The data from both seasons also indicated that regardless of the K2O and S applications, the fruit weight was higher with the application of N1 than with N3. However, the fruit weight was significantly higher in the first season with the application of N2 than with N1 and N3. Furthermore, the fruit length was greater in both seasons with the application of N1 than with N2 and N3. The fruit width was greater in the second season with the application of N1 and N2 than with N3. 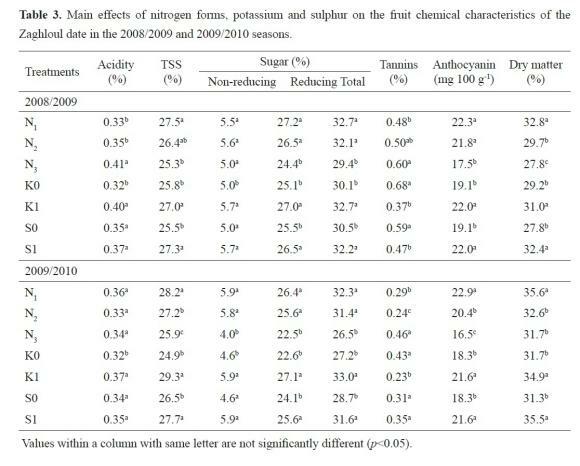 However, the different forms of nitrogen did not produce significant differences in fruit shape (Table 2). The fruit colour value was significantly greater with the application of N1 than with N3 in both seasons. N1 and N2 did not produce a significant difference in fruit colour. 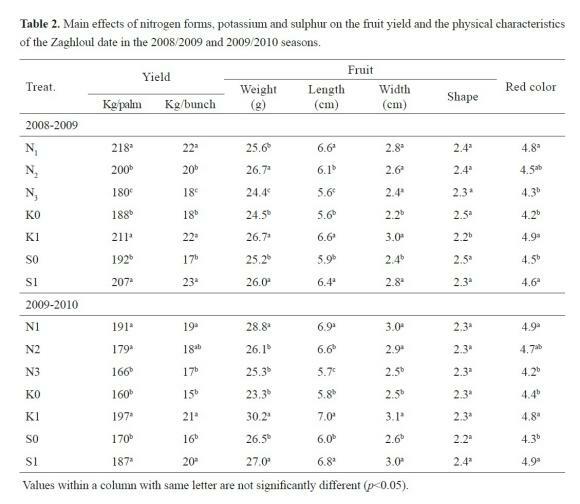 Potassium and sulphur fertilisation significantly increased the fruit weight, length, width and colour, whereas the fruit shape was not affected (Table 2). The results of the study indicated that regardless of the K2O and S rates, the fruit acidity was lower with the applications of N1 and N2 than with N3 in the first season (Table 3). The fruit TSS content was significantly greater with N1 than with N2 in the second season and significantly greater with N1 than with N3 in both seasons. The content of non-reducing sugars in the fruit was greater with N1 and N2 than with N3 in the second season. The content of reducing sugars in the fruit and the total sugar content was greater with N1 and N2 than with N3 in both seasons. The fruit tannin values were lower with N1 than with N3 in both seasons. However, the lowest value of tannins was observed with N2 in the second season. The anthocyanin content was greater with N1 and N2 than with N3 in both seasons. The dry matter content of the fruit was greater with N1 than with N2 and N3 (Table 3). Potassium fertilisation produced a significant increase in fruit acidity, whereas fruit acidity was not affected by the sulphur application. The potassium and sulphur applications increased the fruit TSS, anthocyanin, dry matter, reducing sugar and total sugar content significantly. The non-reducing sugar content was increased by potassium fertilisation, with potassium fertilisation in both seasons, whereas whereas it was not affected by sulphur application. sulphur application lowered the fruit tannin content An obvious decrease in fruit tannin was observed only in the first season. Regardless of the K2O and S application, the results showed that leaf N was greater with the application of N1 and N2 than with N3. The leaf P, K, Ca, Fe and Zn contents were greater with N1 than with N3. However, the leaf Mg and Mn contents were greater with N2 than with N1 and N3. The leaf Na content was not affected by the N form (Tables 4 and 5). The study also showed that the leaf N, P, K, Fe, Zn and Mn contents were increased significantly by the potassium and sulphur fertilisation. However, the Ca and Mg contents decreased with the potassium application, whereas Ca was not affected by the application of sulphur fertiliser. The leaf Na and Cu contents decreased with the sulphur application and were not affected by the potassium fertiliser. The results of the study (Tables 4 and 5) showed that the fruit N, Fe and Zn contents were greater with the N1 application than with N2 and N3. In the second season, the fruit P and Ca contents were higher with N1 and N2, respectively, than with N3. In addition, the fruit K content was significantly greater with N1 and N2 than with N3. In contrast, the fruit Mg, Mn, Cd and NO3 contents were less with N1 and N3 than with N2. The fruit Pb content was less with N1 than with N2 and N3. However, the nitrogen form had no influence on the fruit Na and Cu contents. The results of the study indicated that the fruit N, K, Fe, Mn, Cd, Pb and NO3 contents increased and the Ca and Mg contents decreased with the application of potassium fertiliser, whereas the fruit P, Na, Zn and Cu contents were not affected. In addition, the application of elemental sulphur significantly increased the fruit N, Fe, Zn, Mn, Cd and Pb contents and decreased the Cu and NO3 contents. In contrast, the fruit P, K, Ca, Mg and Na contents were not influenced by the sulphur application (Tables 4 and 5). 4.1. Yield and fruit physico-chemical characteristics Our results showed that the application of ammonium sulphate produced a higher yield, fruit weight and fruit dry matter content than ammonium nitrate or urea. Ammonium sulphate (NH4) SO4 in the N- form (containing 24 % sulphur) decreases the soil pH and might therefore favour the availability and uptake of elements by plants in slightly alkaline soils (Guelser, 2005). Moreover, ammonium assimilation into plant metabolites requires less energy than nitrate assimilation because ammonium does not need to be reduced. Plants may save energy by assimilating reduced nitrogen, and this saved energy may be used to increase the production of secondary metabolites (Elwan and Abd El-Hamed, 2011). In addition, the application of ammonium sulphate and nitrate forms resulted in higher fruit quality characteristics than the application of urea. This difference may have resulted because urea is not suitable for fertilisation under conditions similar to those of the present study. The gaseous loss of ammonia following urea fertiliser application may include up to 75% of total nitrogen, whereas less N volatilisation occurs from other forms of N fertiliser. The ammonia volatilisation losses with ammonium sulphate were lower (4% of the N applied) and produced greater nitrate leaching and greater soil acidification than urea (Cantarella et al., 2003). The validity and uptake efficiency of nitrogen depends on the form applied (Sady et al., 2008). Urea-based fertilisers are particularly susceptible to nitrogen volatilisation losses in warm climates and light-textured soils with pH greater than 7 (Nielsen, 2006). These growing conditions are similar to those of the Zaghloul palms investigated by the present study. The differences in plant yield responses to the various forms of N fertiliser are due primarily to differences in the N losses from the soil rather than to differences in the N assimilated (Abassi et al., 2005). Our results showed that the application of KO2 fertilisation significantly increased fruit weight, length, width and colour. Although K is not a constituent of any organic molecule or plant structure, it is involved in numerous biochemical and physiological processes vital to plant growth, yield, quality and stress (Cakmak, 2005). Adequate K nutrition has also been associated with increased yields, fruit size, increased soluble solids, improved fruit colour, increased shelf life, and shipping quality of many horticultural crops (Kanai et al., 2007). The effectiveness of sulphur in increasing fruit yield and quality is clearly documented by reports that plants assimilate inorganic sulphate into cysteine, which is converted into methionine (Nicoforova et al., 2003). This amino acid and others (e.g., tryptophan or phenylalanine) are precursors for the production of glucosinolate, a group of health-promoting compounds (Schonhof et al., 2007). N and S interact to exert a strong effect on various growth parameters, such as biomass and yield (Salvagiotti and Miralles, 2008). Sulphur is an essential constituent of enzymes involved in N metabolism (Swamy et al., 2005), and its availability could lead to an increase in N assimilation. Elemental sulphur is strongly involved in improving nutrient assimilation and in stimulating the anti-oxidative defence system of plants through its metabolite glutathione (Gondent and Ullman, 2000). Generally, the beneficial effects of N1 on leaf and fruit mineral contents, such as the contents of P, Ca, K, Fe and Zn, might be attributed to the ability of N1 to reduce the soil pH. Decreases of up to 1.7 pH units can be achieved in the 0-20 cm depth layer (Cantarella et al., 2003). This acidity increases the availability of nutrients, such as P, Mn, Ca, and SO4, in soils (Mar-schner, 1995). It also enhances the solubility of nutrients and increases the activity of micro-organisms, thereby increasing the plant's ability to absorb and transfer mineral elements (Kandil et al., 2010). The superior effect of ammonium sulphate on leaf N content may be attributed to lower N volatilisation. Fruit Cd and Pb content increased when N was applied in nitrate form. The influences of different nitrogen sources on Cd accumulation in plants have been reported by others (Mair et al., 2002), who found that the use of calcium nitrate as the N source resulted in a significantly higher fruit Cd content compared with ammonium sulphate. In addition, Shahein et al. (2003) found that ammonium nitrate increased fruit Cd compared with urea. Additionally, Alpha et al. (2009) reported that NH4+-N treated plants had the highest N and lowest Cd concentrations, whereas NO3-- N treated plants had the lowest N and highest Cd uptake. 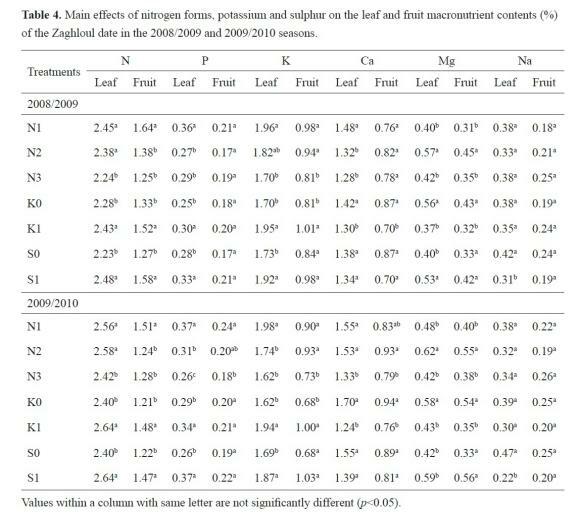 An increase in the leaf or fruit N, P, K, Fe, Zn and Mn contents in response to the application of K2O fertiliser has been previously noted under experimental conditions similar to those used in this study (Kassem et al., 1997). The uptake of nutrients, particularly cations, is significantly influenced by K2O fertilisation. K has thus been shown to affect the absorption, trans-location and distribution of other cations (Epstein, 1972). However, the lack of any effect of K2O fertilisation on the Ca and Mg contents was expected. Cation antagonism between K+ and Mg++ (Eaton, 1971) and between K and Ca (Fageria, 1983) could possibly explain the decrease in leaf Mg and Ca content with K application. The fruit Cd and Pb content increased with K and S fertilisation. Many previous studies have confirmed the positive effect of potassium sulphate on Cd uptake by plants (Zhao et al., 2003). These authors reported that K fertilisers are always accompanied by anions, such as sulphate, which have been reported to increase Cd concentrations in plants. In addition, the sulphur anion, whether applied as a sole treatment or accompanied by K, was also found to increase Cd accumulation in plants (Grant et al., 1999). However, McLaughlin et al. (1998) showed no significant increase in Cd uptake in response to sulphur and suggested that sulphur would not have the same effect as chloride on Cd uptake. A strong relationship between soil salinity (chloride concentration) and Cd accumulation has been reported (Norvell et al., 2000). Thus, studies of the effects of K and S fertilisation and soil conditions on plant Cd and Pb accumulation are very important to minimise the concentrations of these heavy metals in agricultural products. The acidity produced during elemental sulphur oxidation increases the availability of nutrients, such as P, Mn, Ca, and SO4, in soils. This effect may enhance the growth performance of plants (Marschner, 1995). The application of elemental of sulphur had positive effects on the concentrations of date palm leaf Fe, Mn, Zn, and Cu (Mohamed et al., 2006). It is probable that these increases resulted from increased availability and uptake through the modification of the soil pH, as reported by Marschner (1995). Sulphur fertilisation significantly influenced the uptake of all elements except phosphorus (Aires et al., 2007). Recently, the possible human health effects of high nitrate content in vegetables and fruits have been a topic of concern. Approximately 5-10% of ingested nitrate is converted into the more toxic nitrite through salivary or gastrointestinal reduction (Boink and Speijers, 2001). Compared with ammonium nitrate, fertilisation with ammonium sulphate and urea has been shown to lower the nitrate content in the edible parts of plants (Sady et al., 2008). Similar findings were obtained in the present study. The nitrate content of the fruits was lower with the ammonium sulphate and urea applications than with ammonium nitrate. Nitrate accumulation in plants is very low if nitrogen is applied in the (NH4)2 SO4 form because this form is slowly nitrified (Goh and Vityakan, 1986). Ammonium sulphate and urea application decreased nitrate accumulation more rapidly than ammonium nitrate (Elwan and Abd El-Hamed, 2011). The results of this study indicate that the application of ammonium sulphate as a N source produced a greater fruit yield and a higher overall product quality of the Zaghloul dates in the experiment. In particular, the use of this N source produced lower contents of nitrate and heavy metal. Special care must be taken if date palms are fertilised with potassium and sulphur because their application rate, their form and the soil salinity might affect the uptake of heavy metals. The proper use of these fertilisers can produce dates of the highest quality and prevent any risk to human health. In addition, this study found that the sulphur application improved the efficient use of the nitrogen and potassium fertilisers in the calcareous soil used in the experiment. It is with sincere respect and gratitude that we express our deep thanks to the Deanship of Scientific Research, King Saud University and the Agriculture Research Center, College of Food and Agricultural Sciences for financial support, sponsorship and encouragement. Eaton. G.W. 1971. Effects of NPK fertilizers on the growth and composition of vines in a young cranberry bog. J. Amer. Soc. Hortic. Sci. 96: 426-429. [ Links ].